Superfast Broadband has arrived in Hutton! Green cabinets have been installed in Elborough at Hillend, Woodside Avenue, Moor Lane and Vereland Road. 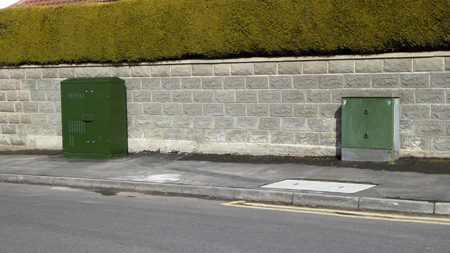 These bring superfast broadband to the smaller green cabinets which connect to individual properties. The slower broadband comes from the exchange on Bleadon Hill for those in Hutton village and Woodside, and from Banwell exchange for those in Elborough. The speed depends on the distance from the exchange and explains why some people only get 1-2M (megabytes per second). By moving the connection to the new green cabinets significant speed increases are possible. The majority of properties are less than 500m from their cabinet which could result in speeds of 50-80M. Even those up to 1km away like on Windmill Hill, parts of Oldmixon Road and Elborough Farm could get more than 50M. Now that the cabinets are live lines will not change over automatically. You will have to sign up for a service with an Internet Service Provider (ISP). Some of the superfast products are BT Infinity, Sky Fibre, TalkTalk Fibre and there are many others. What are some of the benefits of superfast broadband? Supports multiple devices and multiple streaming, so the entire family can be online at the same time. The cabinets are funded by the government BDUK scheme and delivered by Connecting Devon and Somerset. A map of the Hutton cabinet locations and the postcodes they serve is here.